Without LibDialog installed, the Addon only shows a missing dependency of LibStub, for some reason it doesn't show the LibDialog dependency, but remains in "Dependency Missing" state. Installing LibDialog allows for enabling the addon as expected. Wha are the libs good for, and do I even need them? Awesome, thanks for the reply! I have no skill, but love learning about this kind of stuff. The reason it did not work was, that the addon checked some data like the name and index. And sometimes the name and/or index are missing (as Votan's Addon List addon adds rows which are no addon, but header lines). I thought we had managed to check these all before but Solinur found out, that there are additional positions where we needed to add the checks (upon saving/loading of the addons). Thank you Solinur and Baertram! While this issue isn't a deal-breaker for me, it's nice to know it's been fixed. This is such a useful addon, I would hate to think someone might not have tried it because of a few negative sounding comments! As an aside, I'd be interested in knowing what Solinur discovered. If you feel this is the appropriate place, great, otherwise either may PM me. (Assuming you're inclined and it doesn't take up too much of your time, of course.) Thanks! Oh, and also, in the Version 1.429 changelog, I think there is a typo involving a missing 'f'. It had me rolling on the ground when I realized why I was seeing asterisks. Last edited by RavenMind : 08/23/18 at 11:50 PM. Seems to happen in conunction with Votans Addon List addon. Solinur was so friendly to debug it and present a way to fix it. Many thanks to him! omg, the extended stats addon started to uncheck itself again! I don't know what the hell is going on anymore. It seemed fixed after recent wave of updates. You all could test if it happens only if you are using the SHIFT key. If not, you could count from the top to the self disabling one and tell me the number of addons and enabled addons until there. Then the total number of addons and total number of enabled addons (shown above in the counter). And all the others having this issue too please. That's a good thought. For me, not using shift, my addon "Dungeon Tracker" is the 43rd addon in the list counting enabled and disabled ones plus the sub add-on items like MM data files, and harvestmap zone entries, combat metrics sub addon, etc. It is 25th counting only first level addons, both enabled and disabled. It's the 14th addon that is enabled for this profile only counting first level addons. I closed the game, edited the saved variables file by hand and restarted the game and now it is the way I want it ... at least until I want to create another profile. 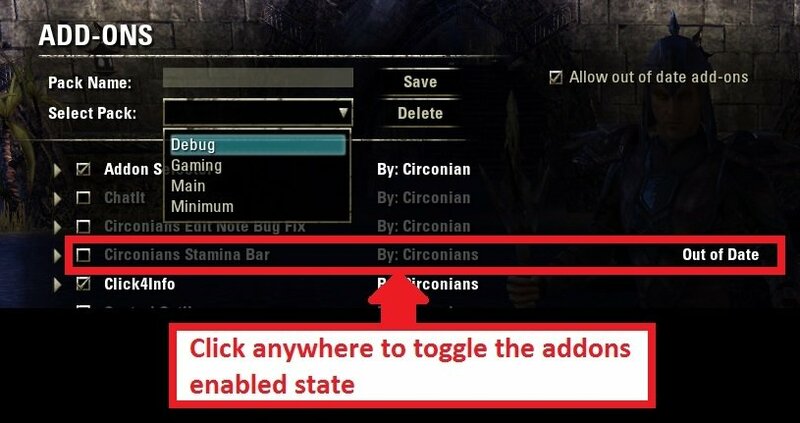 If this will not bring us further more to any "rule" we could add debug messgaes in your addons in order to get a list of enabled/disabled addons, dependency info or other stuff to check why something might get not enabled/disabled. Maybe there is a time frame where a dependent addon of your addon, which does not get enabled properly, is disabled and disables this adodn of yours too (like harven's addons always depend on his own LiBHarvensAddonMenu or something like this). Last edited by Baertram : 08/19/18 at 12:06 PM. Does this addon turn off Harven's Extended Stats when you save a profile on anyone else besides me? Not sure why it does this, but it sometimes does. It depends on if the non-saved addon got some "internal data" missing as it seems which is provided by the game itsself. yeah, makes it almost impossible if it isn't happening to you. For me it's Dungeon Tracker addon but minor annoyance at best. Overall I live and die by this addon for my addons are extensive and this makes situational addons a thing.